[Episcopal News Service] Looking back on the horrific assassination 50 years ago of the Rev. 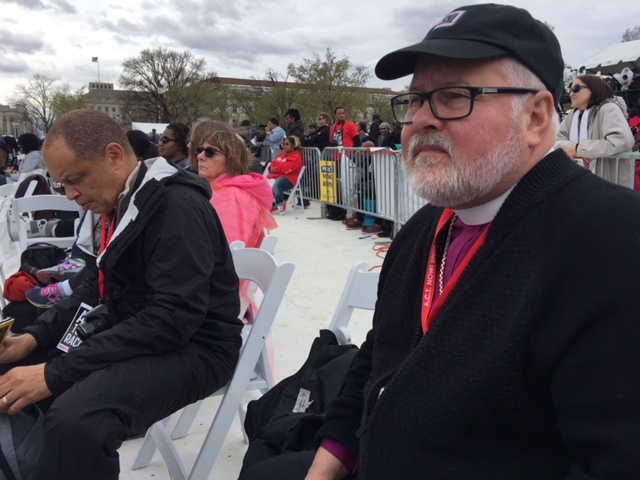 Dr. Martin Luther King Jr. and looking forward to the end of racism, Episcopalians came with thousands of others to the National Mall in Washington, D.C., April 4 for the A.C.T. to End Racism Rally. The day began cold and windy, and just before noon organizers delayed the rally for nearly 45 minutes out of concern for what one unidentified woman at the microphone called “a rapidly moving weather front” approaching the capital. She asked rally marshals to help attendees find cover in nearby museums, including the Smithsonian Institute. That weather delay caused the organizers to reshuffle the lineup of more than 60 speakers. Both Presiding Bishop Michael Curry and Evangelical Lutheran Church in America Presiding Bishop Elizabeth Eaton were bumped from the list. Curry was scheduled to lead off the rally’s last section, which formed a call to action and next steps. Instead, as the rally went on, he recorded a video message for the National Council of Churches, organizer of the event, to use. “We will act now, and we will act for our future, joining our brothers and sisters so that the future for our children will be a future worthy of them,” Curry said as he stood on the mall with the U.S. Capitol in the background. Curry said people gathered for the rally to “act now to engage in the work of seeking to eradicate racism and its vestiges in our country, and in our world. Curry pledged the Episcopal Church’s commitment to making that hope a reality. “On this day and the days going forward, we as Episcopalians join with our fellow Christians and other people of goodwill and of all faiths and types who seek to make this world something that more closely resembles God’s dream and not a human nightmare,” he said. The rally’s speakers, each of whom were given a short amount of time at the microphone and many of whom ran over their time, included Christian, Hindu, Jewish, Islamic and Zoroastrian leaders. Secular activists spoke as well, including actors, singers, doctors and Ben Cohen and Jerry Greenfield, the founders of Ben & Jerry’s. Cohen told the crowd that if he and Greenfield had been black, the ice cream company would not exist. “The deck would’ve been just too stacked against us,” he said. 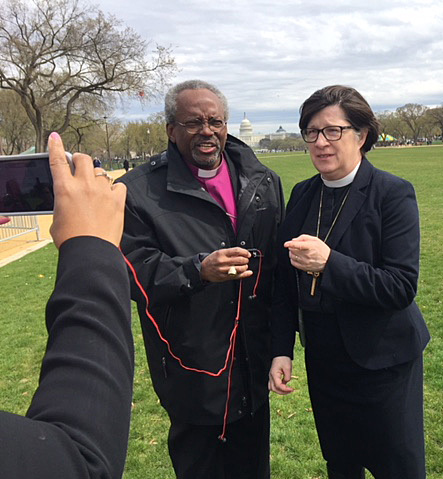 The NCC, to which the Episcopal Church and nearly 40 other Christian traditions belong, vowed to “pick up the torch and carrying on with a multiyear effort to finish the work Dr. King began.” The effort is also endorsed by an ecumenical group of religious organizations. A.C.T. stands for awaken, confront and transform, and the NCC says its goal is to remove racism from the nation’s social fabric and bring the country together. The night before the rally, many participants met at Saint Sophia Greek Orthodox Cathedral in Washington, D.C., to pray for an end to racism. The service took place on the Greek Orthodox Church’s Holy Tuesday, a day with a liturgy that is noted for its theme of repentance, according to the cathedral’s website. The rally and surrounding events will be followed April 5 by a National Day of Advocacy & Action. The day will include training in how to organize effective legislative visits and other aspects of such advocacy work, as well as actual visits to congressional offices. Curry’s planned participation in the rally was part of the Episcopal Church’s larger pledge “to act faithfully on its long history of honorable General Convention and Executive Council intentions but imperfect and fragmentary practical actions in matters of poverty, racism, sexism, and economic justice,” as the church’s Executive Council said in a resolution it passed at its January meeting. That resolution called for the church to develop an official relationship with the 2018 Poor People’s Campaign: A National Call for Moral Revival. 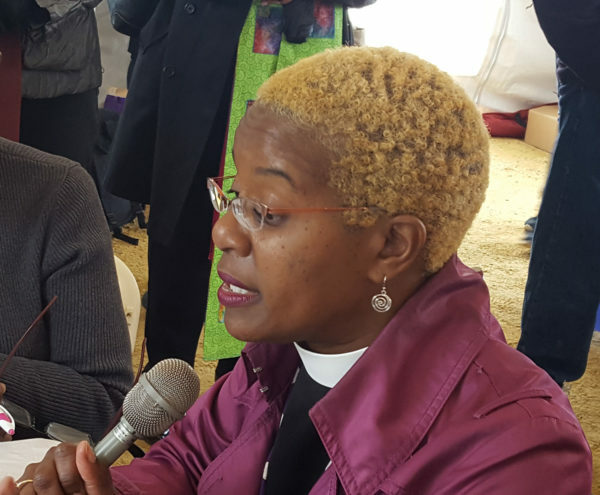 The Episcopal Church is in the midst of a season of justice engagement, the Rev. Chuck Wynder, the church’s officer for social justice and advocacy engagement, told Episcopal News Service. That season has already included Episcopalians’ participation in the March 24 March for Our Lives. Wynder said the church’s involvement is also a way for Episcopalians to live into the Becoming Beloved Community effort that offers the Episcopal Church ways to organize its many efforts to respond to racial injustice and grow a community of reconcilers, justice-makers and healers. Getting involved in the 2018 Poor People’s Campaign is a significant step in that direction, he said. The 2018 campaign echoes King’s plan in 1968 for a Poor People’s Campaign, a plan he announced in a sermon on March 31, 1968, from the pulpit of Washington National Cathedral. “There is nothing new about poverty. What is new is that we now have the techniques and the resources to get rid of poverty. The real question is whether we have the will,” King said in what would be his last Sunday sermon before his death. King assured the congregation that this would not be a “histrionic gesture” or one meant to cause violence. “We are coming to demand that the government address itself to the problem of poverty. We read one day, ‘We hold these truths to be self-evident, that all men are created equal, that they are endowed by their Creator with certain inalienable Rights, that among these are Life, Liberty, and the pursuit of Happiness.’ But if a man doesn’t have a job or an income, he has neither life nor liberty nor the possibility for the pursuit of happiness. He merely exists,” he said. Those demonstrations had been tentatively set for June 15, 1968. King was gunned down on April 4 by an assassin in Memphis, Tennessee, four days after his sermon at Washington National Cathedral. Thousands of people spilled out of the cathedral on April 5 to mourn his assassination. The cathedral will commemorate King’s sermon on April 4 with a choral evensong that will include scripture and music associated with the recognition of King. Following the service, the cathedral will play the sermon, titled “Remaining Awake Through a Great Revolution.” A non-downloadable audio recording is here. Washington National Cathedral also will participate in a worldwide tolling of church bells the evening of April 4. The toll will begin with the bells at the National Civil Rights Museum in Memphis at 6:01 p.m. CDT, followed by bells throughout that city, and then across the country and the world. The cathedral’s bells will sound at 7:05 p.m. EDT. Many Episcopal churches plan to join the tolling. The Very Rev. Randolph Marshall Hollerith, dean of the cathedral, recently noted that King was invited to preach in the cathedral to “explain ‘to the white clergy and the people of Greater Washington’ that his planned Poor People’s Campaign was intended to be ‘non-violent’ and not ‘disruptive of life in Washington.’” However, some Episcopalians protested the invitation. “It appears obvious that King’s purposes are definitely racist (one group only) and whose goal is to stir up more racial tension and anxiety, which can only lead to disaster,” one woman wrote. The cathedral will also commemorate King’s last sermon during its 11:15 a.m. Eucharist on April 8. 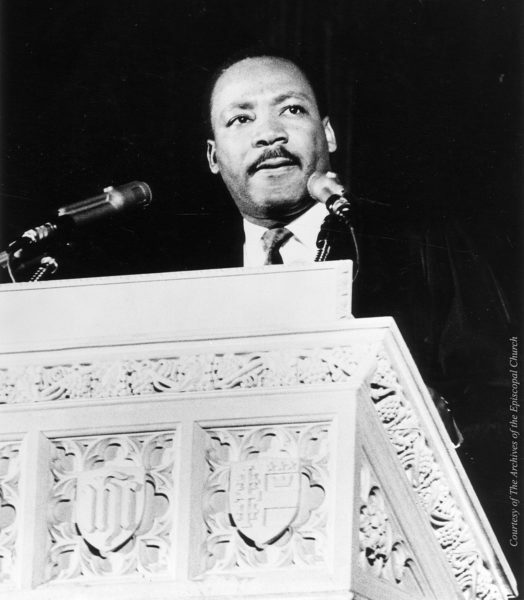 The service will include recorded excerpts of King’s sermon along with music and prayers from the March 31, 1968 service. And, in Memphis on April 7, St. Mary’s Cathedral in the Diocese of West Tennessee will host a commemoration of the April 5, 1968 Ministers March, during which about 300 clergy gathered at the cathedral the day after King was killed about two miles away. The Very Rev. Andy Andrews, St. Mary’s dean, said in a recent letter that those clergy members, “after prayer and soul-searching discussion,” adopted a statement favoring the striking city sanitation workers whom King had come to the city to support. Approximately 150 ministers then marched from St. Mary’s to the mayor’s office to present their demands. Then-Dean Bill Dimmick led the march with the cathedral cross. “The cathedral congregation has never been the same,” Andrews said in his letter. Let a little rain keep them from their job? Pitiful. So sorry to have the PB bumped. It did get pretty rough out there, though. The only way that bigotry [racism is misused] will be defeated is when humans no longer exist. That is to say that if there are humans there will be evil. Now if only the Episcopal leadership will actively call out the racists in the Black Lives Matter movement, and the Muslim Brotherhood, and Louis Farrakhan and the Nation of Islam hate groups. That much of the “official speak” and anti-racism training singles out “whites only” is shortsighted, and dare we say a little racist itself? Hate and intolerance is fluently practiced by every race. Hard to see that fact in any recommended training that were all told will help to assuage the sin. Yes, Doug, there is bigotry in all groups, faiths, and communities. But, thanks to the leadership of PB Curry, we are working to become, if we are not already, the Jesus Movement in the Episcopal Church. With that goal in mind, we want to look at our own house, find our more subtle racism and not spend too much time creating lists of sinners in other faiths and groups. Hey, folks, it’s been less that a week since we lit the New Fire and someone sang, “the Light of Christ” and carried it down the aisle to shine ifs light on the Cantor as (s)he sang the Exaultat. We’ve got to carry that light and that song out of the building into the world!! There may be bigotry and prejudice among minority groups but racism applies to the dominant racial group’s attitudes toward those of a different race. Trying to diminish the evil of racism by accusing racial minorities is just another way white folks (I’m white for what it’s worth) try to excuse their racism. I was 18 years old when Dr. King was murdered. I grew up with segregated buses, water fountains and the like. That is racism, Doug. Those vestiges still remain only they manifest themselves in more subtle ways. It takes work to see that our unearned privilege as white people supports our racist attitudes. It takes more work to try and turn our hearts toward the ultimate goal of a beloved community where everyone respects the dignity of every other person without qualification. I hope the recorded statement will be posted soon. I would like to hear what the bishops had to say. Bruce, you think of people in terms if identity politics; that is, in groups. I don’t. While what happened 60 years ago was despicable there has been progress made. Lingering over the corpse of that era is not how to address the dynamics of today. We don’t live under segregation mandates anymore. By and large I see people of all races and walks mingle and get along with each other. Those who will not are not in monolithic groups but are outliers – sometimes noisy, disruptive, or violent – but outliers and hardly in a majority. Are there racists? Yep. Of all backgrounds. My reading of the recommended training materials and much conversational focus minimizes that and instead couches the discussion on white privilege. While that exists it does not exist to the preponderance that is being relied on. To believe that means that one has to ignore the ability and endurance shown time and again by people of other races. I’m not willing to assign them the status of being oppressed and helpless and make whole groups a “victim” when their durable spirits and efforts have shown that they surpassed as individuals. I believe that “white racism” must be the most misused term in the English language. That is, until it is replaced by something else that has become equally fashionable. . I, along with 3 other seminarians from SC, participated in the Rally to End Racism to witness and lift our voices in support of the love of Jesus Christ. Within our communities we all enjoy privilege – the sense of belonging. I have seen, heard, and felt racism. I recognize the continued disparities in education and opportunity, and the exposure to harm. My prayer is that I live my life aware of bias, known and unknown, loving all who I encounter, acting and speaking out with solutions – not judgment. Cynicism is corrosive. All forms of “isms” against one another is sin. Imagine living and seeing through the lens of good will. Not our will, but God’s will. I am not sure if “white racism” or for that matter “anti-Semite” are misused terms. Perhaps, it is best to recognize these problems and work to bring more harmony in society.